(Blooming Prairie MN July 31, 2018) – When the dust settled – and there was a lot of dust – the Minimizer Bandit Big Rig Series did what it set out to do, which is entertain a legion of fans and leave them with a lifetime of memories. An unforgettable weekend of back-to-back events was met with a chorus of cheers, countless oohs and ahs, and some new fans for life. "If rubbing is racing, we definitely had some good racing going on this weekend!" Bandit Race Director Brian Madsen said. "The boys were feeling a little chippy and weren't cutting anyone any slack." It all started at La Crosse Speedway in Wisconsin Saturday night, where rookie Mike Ward (#16) drove like a man possessed. "It's been a long time since I've been in victory lane," Ward said. Ward led every lap of the feature race and stole the checkered flag as well as a $10,000 check. "Even though Ward led every lap, he had his hands full with his truck being on old tires," Madsen said. "The last ten laps, the tires were done. There was no traction and I was just trying to save my right front (tire), but it worked out," Ward said. Jon Lisenbee (#7) and Justin Ball (#17) finished two-three in La Crosse, and the very next day Hawkeye Downs Speedway in Iowa, Ball was declared the winner after rain put an end to the feature mid-race. 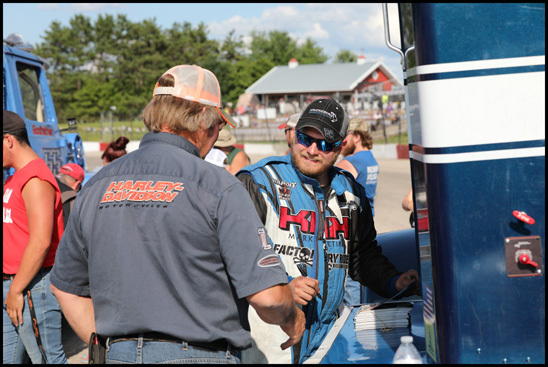 "It feels unbelievable," Ball said after capturing his second Bandit feature race in three events. "The last time we were here, (the track) felt like it was fast and we just tried to keep that going." Ball has jumped up in the standings, thanks to an impressive run that started with a feature win in Salem, Indiana. The man they call ‘Boost' is now in fourth, while Ricky Rude (#17) remains on top as the Bandits get ready to run Hickory Motor Speedway Saturday, August 11th . "It's going to be exciting," Bandit General Manager Jason Johnson said. "The World's Most Famous Short Track is a legend where many racing superstars got their start. We can't wait to get back there." Tickets for the Hickory event are available for purchase online.